Details, details - this watch has so many beautiful details. It's a model from the Swiss Legend Eograph collection. The salmon colored dial has several visual elements that make its style rating a WOW! Unfortunately, you can't see the fine details of the watch here. 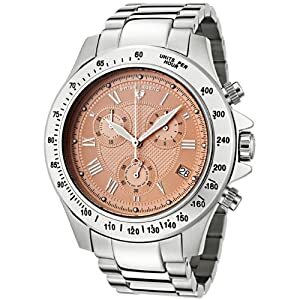 Click to see a better picture on Amazon's site, and you'll find that the dial has 3 different textured patterns. Roman numerals mark the hours, with raised silver dots along the outer edge. The silver toned hands stand out against the color of the dial, making it easy to tell time at a glance. The hands are luminous, too. With a reliable Swiss quartz movement, stopwatch functions, and a water resistance rating of 330 feet (100 meters), it's clearly both stylish and functional. Take a closer look! I love hand watch. The Swiss Legend Eograph collection model really really so beautiful. I just say its fantastic. But guys you should share with us some more details about your hand watch. There are lots of details on the face. I am my wife to get me this one for Christmas because of the very subtle color on the dial. I think it will look good on me no matter what I clothes I wear. The price is quite nice, too.